The first radio broadcasting station installed in Turkey was a 7 kW longwave unit that was inaugurated on May 6, 1927 under the callsign TAC. This new station was installed in Ankara, the capital city, which is located almost in the center of their country, and it operated on 166 kHz. Their first mediumwave station hit the air nearly a quarter century later, in January 1950. This new facility, under the callsign TAW, was a high powered station, with 150 kW on 704 kHz. Even to this day, in an era when some countries have closed out all of their mediumwave stations, yet Turkey still maintains a network of six high powered mediumwave transmitters which can be heard nationwide, and beyond in neighboring countries. In addition, there are some 2,000 FM stations on the air throughout both territories of their country, in Asia Minor and the eastern edge of Europe. In 1933, Turkey gave consideration to the installation of a shortwave facility, for internal and external coverage. This new shortwave station was installed in Etimesgut, an outer suburban area west of the capital city Ankara. Preliminary test broadcasts began in May 1938 on 10710 kHz under the callsign TAO, and these were reported by an international radio monitor living in Cuba. This new shortwave station contained two American made RCA transmitters each rated at 20 kW. The first transmitter TAO was noted with additional test transmissions in July (1938); and preliminary test transmissions from the second unit under the callsign TAS were heard in the United States, also in the same month July. This new shortwave station with its twin transmitters was hurried into regular operation on November 10, due to the sudden and unexpected death of their first national president, Kemal Ataturk. In the early days of wireless communication, Turkey was allocated the alphabetic sequence beginning with the two letters TA to identify stations throughout their country. 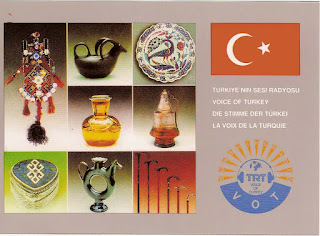 As in a lot of other countries back in the early days of radio broadcasting, the Turkish authorities issued a separate callsign for each transmitter, as well as for each different shortwave frequency in use. Thus all 26 possibilities for three letter callsigns running from TAA to TAZ were already allocated for use in the Turkish radio scene in the era immediately prior to the beginning of World War 2. However, the best known callsign in use by TRT, the Turkish Radio & Television Corporation, would have to be TAP, a major shortwave callsign. An additional 100 kW Marconi transmitter was installed in this same transmitter base at Etimesgut in 1950, together with an additional 20 kW unit and a system of 6 directional antennas. The two older and ailing 20 kW transmitters were still available, though they were not always in service. Twenty years later, the entire station at Etimesgut was ailing, and its usefulness was faltering. A big new station was constructed at Cakirlar in an open area a little north of the airport at Ankara. This station was taken into service in 1970, and ultimately it contained a total of five shortwave transmitters, three at 250 kW and two at 500 kW, all made by BBC Brown Baveri in Switzerland. Then 20 years later again, another shortwave station was constructed, this time in a desert area near Emirler, a few miles south of Ankara. With a total of 5 Swiss made transmitters at 500 kW, this station was taken into service in 1992. The first international shortwave station in Turkey, Etimesgut with its three transmitters at 20 kW and one at 100 kW was phased out and closed after more than 30 years of on air service when the second station was constructed. The location for this first station was in what is now an industrial area. The second international shortwave station in Turkey, Cakirlar with its five high powered transmitters was phased out and closed after a quarter century of on air service when the third station was constructed. The location for this second station was in an open area near the main city airport. The third international shortwave station in Turkey, Emirler with its 5 transmitters at 500 kW is still on the air to this day. The station is heard almost worldwide and it is on the air daily in 21 languages. Three tall self standing towers, each with its own subsidiary buildings, can be seen on Google Earth at 39 30 07 05 N & 32 51 38 80 E.
TRT Turkey has always been a reliable verifier of listener reception reports. In earlier times, their QSL cards listed all of their radio broadcasting stations together with callsigns and power; in more recent times their QSL cards have been picturesque cards in full color in various different styles. More on the radio scene in Turkey next time.